Before you start, we highly recommend that you pick up a copy of Storey’s Guide to Raising Ducks: Breeds, Care, Health . This book is one of the best books on raising ducks, and every duck hobbyists should own a copy. You can pick up a copy of Storey’s Guide to Raising Ducks: Breeds, Care, Health on Amazon today! Ducks make great pets and 4-H projects when you have a young child. Ducks as a species are usually very gentle, have calm personalities, are very hardy, and are a lot of fun to have around the house. Thus, it is easy to see why people love raising ducks. If you have never raised a duck before you might want to consider getting either a Pekin duck, which is the most common commercially raised breed of duck, or a Muscovy duck. Both of these duck breeds are extremely hardy and making it easier for the duck to survive any mistakes you might make. The Muscovy is an excellent duck to own if you live in an area with a vast insect population, there is very little this duck likes better than hunting and eating bugs. One of the best places to acquire your first ducks is from a professional hatchery. Baby ducks from hatcheries are usually healthy and the company is very adept at shipping ducks, plus you have a wide selection of duck breeds to select from. The downside to ordering your ducks from a hatchery is that you usually have to order several ducks at a time. Once you receive your baby ducks, you will need to place them in a duck brooder. If you don’t want an entire flock of ducks, you can talk to some local farmers and see if they have any ducks that they would be willing to sell. In the springtime several feed stores and farm supply stores sell ducklings. When you are selecting a duck you want to pick one that has clear eyes, all of its feathers, and appears to be active. Regardless of how you choose to start, it’s never too late to learn how to raise ducks. Learn how to feed ducks! 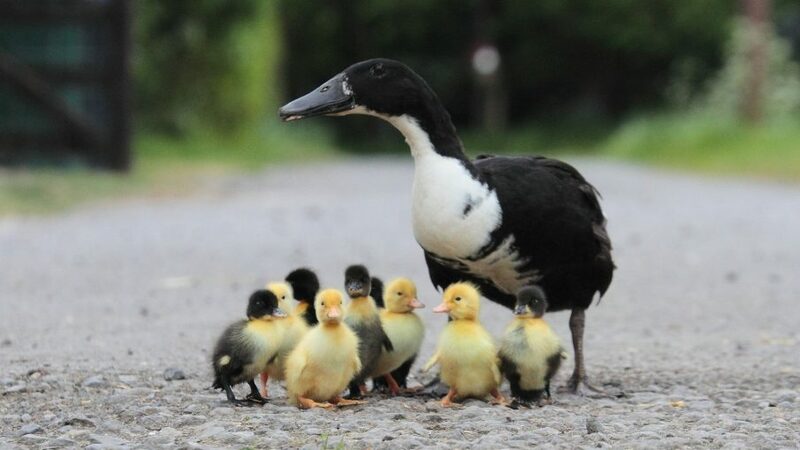 If your ducks have just hatched, they will need to be fed a duck started food until they are two weeks old. When they have passed their second week birthday you can switch your ducks to commercial duck food. Ducks do best when they are fed a pelleted fed. When you are feeding your ducks take a few seconds to sniff the food, if it smells like mold you should dispose of the feed. Eating moldy food can compromise your duck’s internal organs. Don’t scatter your duck food on the ground it’s a waste of grain. Feed your ducks in a feed hopper. Make sure that you ducks always have access to clean water that they can drink. When you are building a pen for your ducks you need to remember that the idea isn’t so much to keep the ducks in but rather to keep the dogs and other duck eating creatures out. The best type of fencing is tightly woven chicken wire that is set so deeply into the earth that it can’t be dug under. Place a cover over at least half of the duck pen so that they are able to get out of the sun. If you provide your ducks with a swimming pool make sure that your ducks can get out of the pool. You will have to empty and clean the pool at least once a week.